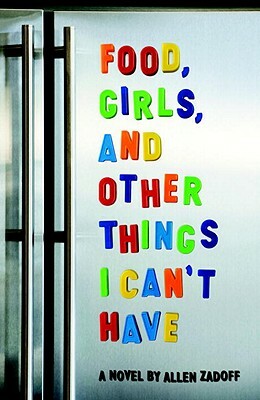 FOOD, GIRLS, AND OTHER THINGS I CAN'T HAVE is the story of a boy who doesn't fit--in his pants, in his family, in his school, or in his life. If Andrew Zansky can only be thin enough, smart enough, or popular enough, he thinks everything in his life will be perfect. His father will come back home. The pretty girl in school will fall in love with him. His Mom will be happy again. While he's working to achieve this fantasy future, Andrew eats. A lot. He buries his problems in his Mom's mini-snacks, analyzing his world while stuffing down his feelings. "When I chew loud enough," he says, "I can't hear myself think. It's like a little vacation." FOOD, GIRLS, AND OTHER THINGS I CAN'T HAVE follows Andrew's journey to self-awareness and self-acceptance (by, unexpectedly, joining the high school football team). By the end of the story, Andrew stops living in his head and starts participating in life. Perhaps most importantly, he comes to understand that feeling different doesn't make him weird or special; it makes him just like everyone else. Allen Zadoff was born in Boston, Massachusetts, and went on to live in upstate New york, Manhattan, Tokyo, and Los Angeles. A former stage director, he is a graduate ofCornell University and the Harvard University Institute for Advanced Theater Training. His memoir for adults is called "Hungry: Lessons Learned on the Journy from Fat to Thin." He currently teaches writing in Los Angeles. Visit Allen at www.allenzadoff.com"